The bank statement upload in QuickBooks is a useful add-on that lets you migrate all the transactions in your local bank account (CSV format) to QuickBooks. You can map each column of your already downloaded statements in CSV to date, descriptions, debits and credits. This will ensure that your transactions are properly imported and rightly presented in QuickBooks with no error. Once all fields are mapped, you can view all the transactions in your bank statement from the excel sheets. Membership savings are directly credited to your co-operative society’s bank account as a lump sum payment from the HR department, but how do you split payment among members so that the report will capture individual’s savings? Using the bank statement upload feature in QuickBooks Online, you can select each member of the co-operative society and their respective savings for that month and the total of the savings, at the end of the exercise, must correspond with the lump-sum payments. With payment or saving schedule, you should find it easy to map. 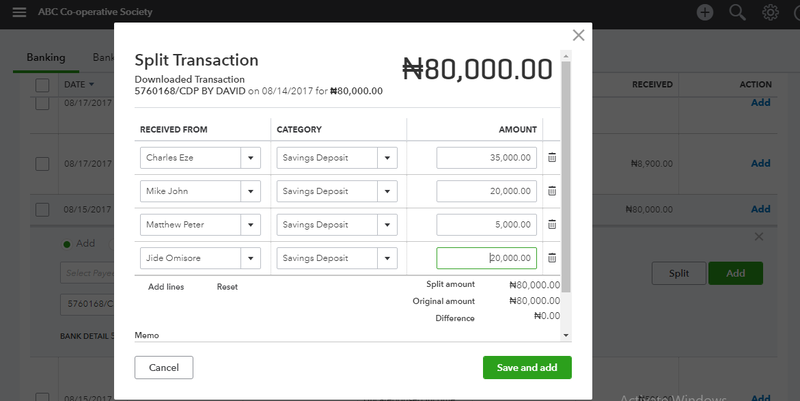 The above snapshot is a sample import of a members’ savings amounting to N80,000 which you can split amount members using savings schedule from the HR department. Co-operative societies invest in fixed income and equity instruments and at the end, expected to generate interest and dividend income. 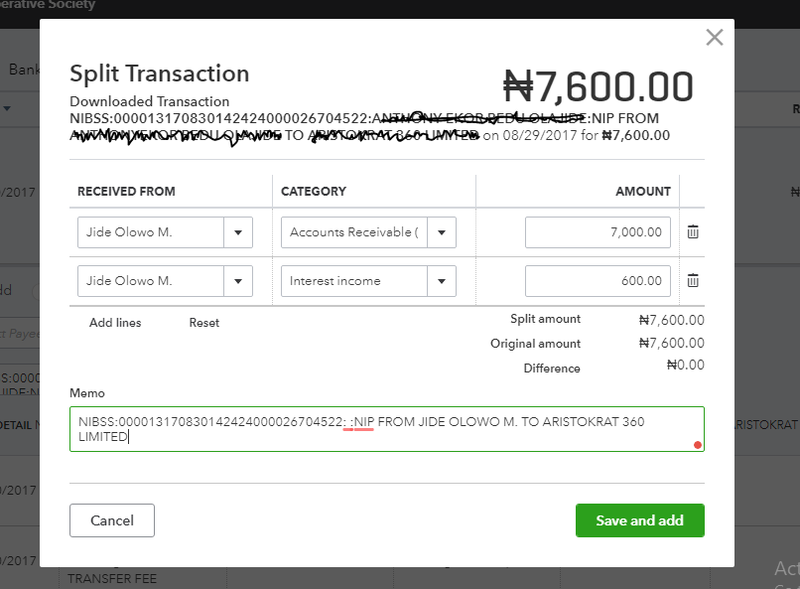 This snapshot below shows how investment in CBN T-Bills and equities are posted during bank statement upload in QuickBooks. For loan disbursement to members and interest repayments, you can also classify all payments on the “Spent” to their respective loan receivable accounts (in the name of the members). For principal payment and interest received on members’ loan disbursed, follow the same process but on the “Received column”, and map against “interest income account” and “loan account receivable account”. The snapshot above shows how a single loan re-payment from a member of co-operative can be split into principal and interest for proper accountability. Savings liability for each member. Loan disbursement report and interest income. Investment account and interest earned. While these are the brief overview of the simple advantages of using QuickBooks Online for a co-operative society, you can also connect with us at bigresourcessolutions@gmail.com or info@accountingsofwtare.com.ng for discussion on how we can meet your custom needs. Previous Previous post: Which QuickBooks Cloud Solution Is Best For Your Business?